The SD460 card printer features Datacard® proprietary print ribbons, topcoats and laminates, designed specifically for the SD460 card printer and featuring our patented radio frequency (RF) technology. When the card printer recognizes that Datacard® Certified Supplies are installed, all enhanced product features are enabled and successful card printing and lamination can begin. The SD460 card printer requires Datacard Certified Supplies with RFID tags. 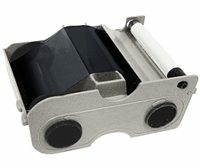 Datacard Group is your exclusive source for proprietary ribbons, topcoats and laminates for the SD460 card printer.